While there's nothing that compares to hearing the thunderous sound of a row of Irish step dancers in person, there's also something to be said for being able to see the dancers' feet up close through Riverdance dance clips shot at different live performances. If you've never seen Riverdance in person or on video, you're truly missing something magnificent. Check out some of these video clips to get an idea of what type of dancing is found in Riverdance, as well as the different types of music that can be heard throughout the show. There is not only Irish music and dance featured, but a famous Flamenco, "Firedance" scene as well. Riverdance is a celebration of music and dance that reaches beyond its Irish roots. Watching some of these Riverdance dance clips will undoubtedly get you interested in seeing more Irish dance or learning more about Irish dance history. After Riverdance took America by storm, there was a huge increase in the number of children and adults who signed up for Irish step dance classes. Many larger studios added this type of dance to their weekly roster, while smaller schools that could not accommodate classes into their regular schedule, offered workshops every few months for dancers who were interested in trying this sensational dance form. The Riverdance show features several types of Celtic dance, including hard and soft shoe dance routines. However, for many people, the hard shoe routines are the essence of Riverdance. The hard shoe numbers are the ones that sound similar to tap dancing. The shoes used for this dance are not the same as American tap shoes, but they do sound alike when you hear them for the first time. The hard shoe routines, such as Reel Around the Sun emphasize the rhythm in the music. Lightning-quick foot movements accent the music, and when the stage is full of dancers doing the same steps, you will be amazed at the reverberating sound the hard shoes produce. 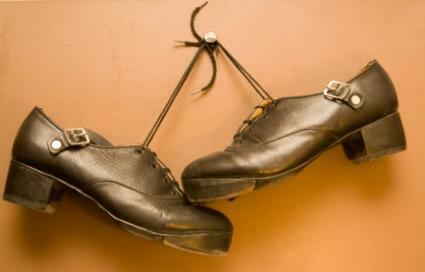 There are a few things that make Irish dance intrinsically Irish. The music is discernibly Celtic in nature; however, there are other ways to distinguish Irish dance from other types of dance even if you can't hear the music. For example, Irish dancers keep their arms flat at their sides while dancing. There are times when the arms move, but the default position is with the arms flat against the sides of the body. This differs from tap dancing where the default position for the arms is most often on the hips (ladies) or behind the back (men). The costumes in Riverdance are also typically Irish. For women the costumes typically consist of short dresses with full skirts. The dancers also wear dark tights that blend in with the hard shoes. These costumes are beautiful and are often more muted than American show dance costumes. For example, if you were to compare the Riverdance costumes with those worn by the Radio City Rockettes you would see that Riverdance costumes are lacking sequins. These costumes provide a beautiful look without the "bling." If you've already seen Riverdance live or on video, you'll recognize all of these elements. If you've never experienced the magic of the dance, you'll likely be bowled over when you do.